“Gail Hamilton” (Abigail Dodge) was one of the founding editors of Our Young Folks. A popular writer for adults, Dodge also wrote for children—everything from stories to books. “The City Girl” has her trademark breeziness and wryly humorous portrait of family life. In its portrayal of city ways and country ways, the story touches on stereotypes of each, but focuses on the difficulties of establishing new relationships. [“]Cicely,[”] called Garnet at the foot of the stairs. “Yes, I ’m coming,” responded Cicely from the depths of her pretty little chamber. “Yes, I ’m coming,” repeated the gentle voice. Garnet supported himself on his elbow and right foot, attempted to scale the stairs on his heels and head, and made other interesting experiments; but finding that Cicely did not come, he climbed up outside of the balusters, over the gallery railing, and bounced into her room. She was standing before the glass, surveying her little self with great complacency. “O, I ’m quite ready this minute,” answered Cicely, hastily catching up her bonnet. “But mehercule!” shouted Garnet, who was devoting himself to the study of Latin with great vigor. “What do you call this?”—and he clutched Cicely’s hair with no very gentle grasp. “O Garnet, now I thought it looked so pretty!” said Cicely; and her bright face was so clouded that even Garnet was rather sorry he had spoken so decidedly. But then certainly it was a case that called for decision. Poor Cicely had spent at least half an hour before the glass, and tired her little arms till they ached; and the result was a knob of hair hanging on one side of her head, and bobbing hither and thither with every motion. Garnet’s comparison was not entirely out of place. “But what could make you think of tricking up such a fright?” he asked. “Why, Garnet, there’s a new girl going to be there from Boston. She ’s going to live with Miss Attredge. And Olive said—” Cicely hesitated. “Well, I know, but—” Cicely hesitated, and faltered, and rather reluctantly began to pull down the comical little contrivance which she dignified with the name of waterfall, and to brush out the long ringlets as she was commanded. And to be sure, she did look like a different girl; still there was many a misgiving in her heart as to the figure she should make in the eyes of the little city lady. Garnet had no share at all in her misgivings. He had a very favorable opinion of his sister, and especially of himself. “Hold up your head, Cicely,” was his admonition, “as you never could with that ten-pound weight hanging on to it, and don’t call the king your uncle!”—though what that had to do with holding up her head, Cicely could never quite make out. By the time they reached Miss Attredge’s house, where the party was to be, most of the children had assembled. They all went to the same school, and were well acquainted with each other,—all except the little city girl, who sat in a corner, and seemed quite as much in awe of them as they were of her. But Cicely took note that she had no silk dress, nor even a waterfall. On the contrary, her hair was short, and her dress a very pretty plaid, but not at all beyond the standard of the dresses in Applethorpe. She was, too, very quiet,—a pale, silent girl,—that was all Cicely saw. “What do you think of her?” whispered Olive to Cicely. “Yes,” said Olive, “and not so much to be proud of either. Nothing but a plaid dress, and not a speck of trimming, nor a net, nor a bow, nor anything,”—and Olive thought very pleasantly of her own French blue merino with its elaborate embroidery. “But I don’t think it is nice at all to be here talking about her,” said Cicely. “I don’t know how,” answered Mary. “Then I won’t play, either,” said Cicely, cheerfully. “I ’ll show you Miss Attredge’s photographs. No, I won’t; I ’ll show you her snakes and birds. Miss Attredge always lets me touch them”;—and Cicely took from the lowest shelf of the bookcase a book so heavy she could hardly lift it; but the kindness in her heart put strength in her arms, and she tugged it along to a chair. It was not in the nature of any girl ever so shy to resist the temptation of looking at pictures so beautiful and so dreadful as those that Cicely pointed out. The birds were wondrously brilliant, and the snakes coiled themselves in folds so fearful that Mary quite forgot her forlorn little self, and the two children were soon kneeling before the chair and pressing their eager heads close together in breathless excitement. When the others had grown tired of “Hunt the Slipper,” they too gathered around the chair, and the two heads were quite overtopped by a crowd of heads, and the two voices lost in a dozen voices chattering and exclaiming and explaining. 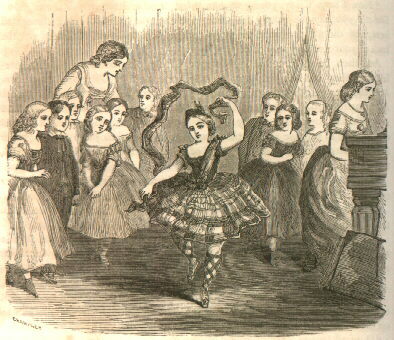 The girls pretended to be very much afraid of the snakes, and shook and shivered. The boys pretended to have a great regard for snakes, and stroked their necks with brown, battered hands. “And let him go?” asked Mary Ravis, eagerly, her fears of strangers quite vanished in the excitement of the horrible stories they were telling. Mary would have been very much frightened, half an hour before, at being thus addressed before them all; but she had lost her first shyness, and Nathan’s banter was so good-natured that she did not feel at all embarrassed, but laughed as heartily as the rest, while a little fresh color stole into her pale cheeks and a good deal of sunshine lighted up her brown eyes. “O, what a story!” laughed Mary. “Why, Cicely, did n’t you tell me so this morning?” asked Garnet, gravely. And then, being forced in self-defence, Cicely told the story of her waterfall, and they all laughed very merrily, somewhat to Olive’s discomfiture. And then came other plays, games of forfeits, in which Mary readily joined. All manner of odd sentences they pronounced upon each other. Nathan in particular found no mercy at the hands of his girl-judges. He was condemned to wriggle across the room like a snake, to jump up in a chair like a squirrel, to bark like a dog, all of which he did so readily and so well, that he made them great entertainment. “Do you? and I like to dance. Mr. Piccini says I dance very nicely, and O, I can dance the Shawl Dance, and the Highland Fling; would you like to see me?” she asked simply. “I know they would! O Garnet! Olive! O all of you! Mary Ravis will dance the Highland Fling and everything Miss Attredge will you play boys all come and sit down!” Cicely was too eager to be particular about her punctuation; but they understood her well enough, much better, indeed, than they understood the Highland Fling, which most of them had never heard of. But they were delighted with the sound of it. reappeared in her usual dress once more, they quite overwhelmed her with their delight. “You are not cross, I am sure,” cried Mary eagerly. “Yes I am cross,” persisted Olive; “I am always cross if people don’t do just as I want to have them right away. Cicely Moreford is the good one, and Erne Mayland, and all those midgets. For my part, I don’t see how people can be so horribly good and patient all the time,”—and Olive put on such an air of despairing humility that they could not help laughing at her.